Great sunny card Tina! Sorry, wednesday I couldn't go to the postoffice, the other days I was at work. Your candy wil be posted tomorrow! Draga Tina, tale tvoja lepotička je pa resnično osupljiva! Obožujem sončnice, ti pa si jih upodobila tako zelo lepo! Čudovita voščilnica! How beautiful! Such an elegant card! Thanks so much for sharing it with us at Penny's Paper-Crafty Challenges! O, taka lepa sončna rumena. This reminds me of the sunflowers in my garden which are just about opening, if they survive these storms that is! Tudi jaz se igram z stencilkami. Lepa sončna voščilnica. Čudovita stencil šablona sončnic in krasna voščilnica. Fantastična in sooončna voščilnica ! 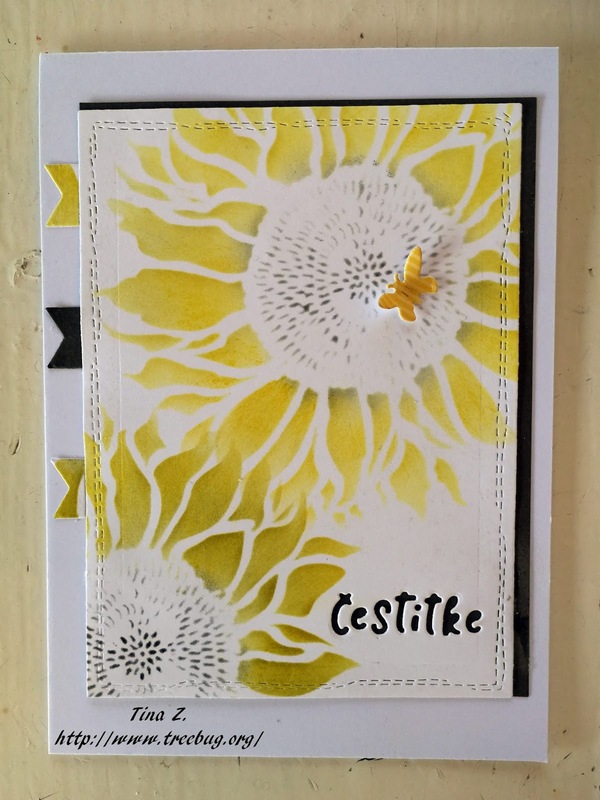 Res odlična za vroče poletje..
Beautiful card,thanks for joining us here at Penny's crafty challenge blog,Lyn DT x. 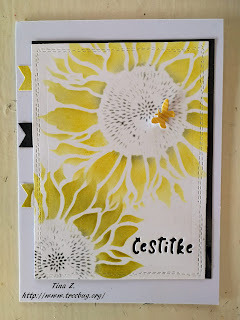 Your card is absolutely gorgeous, the sunflowers are fab! Thanks so much for playing along with Uniko this month. Deborah, DT. The yellow flowers are really pretty! So glad you shared your creation at Crafty Catz. Beautiful, thanks for playing along in our sketch challenge at Catch The Bug. Beautiful pair of sunflowers and I love your little finishing touches. Thanks for playing at Uniko. Lovely. Especially the little butterfly touch. Thanks for joining CUTplorations.